1x 240mm Radiator. Never worry about that the coolant will leak out. Outstanding cooling performance: Featuring with a copper microfin waterblock, a smart cooling fan,a powerful water pump and a 27 120 mm radiator, the water cooler can remove excess heat efficiently. Liquid cooling simply works better than air cooling and the special design makes it easy for you to protect your valuable CPU. Provide the excellent heat dissipation, as you need for highly overclocked desktop processors. Flow Rate: max 500L / H. Power: 10W. Water tank capacity: 250 ml. If you do not receive our reply within 48 hours, pls. If you are satisfied with our service, pls. With its kink-resistant tubing and matt-black styling, the MasterLiquid Lite 120 is a Cooler Master original design and attractive entry into liquid cooling. 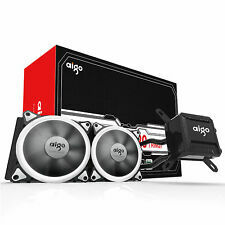 Reliability, performance and quiet operation are ensured by its unique Dual Dissipation Pump and 120mm Air Balance fan design. Trending at $52.89eBay determines this price through a machine learned model of the product's sale prices within the last 90 days. Cylinder Reservoir Water Tank is a ideal tool for cooling system of your computer. 1 Cylinder Water Tank. Material:POM Acrylic. Notes: The real color of the item may be slightly different from the pictures shown on website caused by many factors such as brightness of your monitor and light brightness. Mfr Part Number: CAPTAIN 240EX WHITE. CPU Applications eWiz is your best friend! Upgraded high-density water microchannel with powerful self-governed circulation system, 10% more efficient heat dissipation. This is a full-cover end-to-end block. The base plate consists of nickel-plated copper, with an acrylic cover. The thin-pin matrix provides optimal thermal transfer to ensure the lowest temperatures possible. 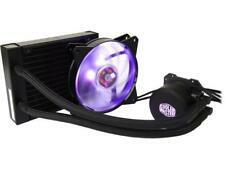 EVGA CLC 240 Liquid / Water CPU Cooler 240mm Radiator RGB LED 400-hy-cl24-v1. Condition is Used. Shipped with USPS Priority Mail Medium Flat Rate Box. Item is in excellent condition and fully functional. This is our SOP, for us to be certain and for record purposes. Power Connector: Small 3P connector. Water tank capacity: 150ml. OEM Charging Port Flex Cable For HTC Incredible 2 ADR6350, Incredible S PG32130. 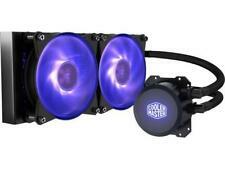 Corsair H100 240 Liquid Cpu cooler. Used,Good appearance and working condition. Cooler works well but has incomplete mounting Hardware. For sale is a Heatkiller tube 200 D5 with accessories. Used but in perfect condition. Only ever used with distilled water & growth prohibitor. The wires were professionally sleeved with high quality dark side sleeving. The sleeving goes into the pump so there is no heat shrink on the pump side. The pump is pwm with molex power. Included parts are reservoir, swiftech d5, multiport top, original top, and mounts. To buy all this separately was close to $200 not including sleeving. All original boxes and instructions are also included. If you have any questions, please don’t hesitate to ask. Thanks! No CPU Cooler! Includes: Mounting Hardware Only! Mounting Compatibility The order cannot be combined or modified after checkout has been completed. checkout before your order will be cancelled. Puerto Rico or Virgin Islands. Watercool Intel 1366 Cpu Water Block. Condition is Used. Shipped with USPS Priority Mail. G1/4 90 Degree Fittings 4 Pack - Black. Condition is New. Shipped with USPS First Class Package. Barrow's Choice line rigid tube fittings in BLACK - 8 PCS Combo (2 for CPU, 2 for GPU, 2 for Radiator and 2 for Pump/Res). TFYKN-T14 - 14mm. Great Condition, used in distilled water only rig for about 2-3 weeks. This DDC pump was pulled from a liquid cooling solution found in a Dell Alienware prebuilt PC. The pump has been disassembled, cleaned, reassembled, and tested fully working. There are brass barbs installed. Mfr Part Number: KUHLER H2O 750. RGB LED illuminates your case and changes color to indicate CPU temperature. Extra large pump and integrated fan were engineered to cool the radiator efficiently. Two Integrated PWM fans automatically adjust fan speed based on temperature. Trending at $49.01eBay determines this price through a machine learned model of the product's sale prices within the last 90 days. CORSAIR - Hydro Series H100i PRO Liquid CPU Cooler 120mm Liquid Cooling System with RGB Lighting - Black/Gray. CORSAIR Hydro Series H100i PRO Liquid CPU Cooler 120mm Liquid Cooling System with RGB Lighting. Included: 1 x Waterblock. It is made for the semiconductor refrigeration film, which can be made of heat dissipation, cold transfer, cold water formation and so on. Material: Aluminium. Interface: approx. 234mm Tank G1/4 Thread Cylinder Reservoir Tank for Computer Water Cooling. Included: 1 x Water Tank. Connector: Top 4 holes / bottom 4 holes. Due to the different display and different light, the picture may not show the actual color of the item. Color: Black Transparent. Material: Acrylic alloy. Stylish and good effect. We will always here to solve them for you. It won't help the problem to be solved. Used 240mm Copper Computer Water Cooling Radiator Cooler CPU Heat Sink G1/4. Condition is New. Shipped with USPS Priority Mail. RGB LED’s, can be synced to other EVGA RGB components. Unique EVGA fan design for reducing noise without sacrificing performance. 280mm Dual Fan Radiator. Radiator Size: 312mm x 139mm x 27mm (LxWxH) Fan Size: 140 x 140 x 25mm (x2). CORSAIR HYDRO SERIES H100i GTX. DOES NOT INCLUDE: MOUNTING SCREWS, CABLES OR ANY ACCESSORIES. They have been tested using water and air to ensure tight fittings. The block has been tested using both water and air. You'll receive the cooler as pictured. This is our SOP, for us to be certain and for record purposes. The base is made of copper. The surface flatness is less than 0.01 mm. The base can fit the CPU better, so that it can absorb more heat from CPU.